Should we trust the eco-bureaucrats or the farmer in Bhutan for eco-solutions? I was cleaning up my office and stubbed my toe against the printed version of Agenda 21, some 700 pages, 2,079 recommendations, guidelines and treaties resulting from the 1992 Earth Summit in Rio — the largest eco–bureaucratic gathering ever held. I hefted the volume to my desk and felt tired just reading the table of contents. All that political energy, all that money. All that effort aimed at saving the world. But it’s hard to keep a party going. In spite of at least eighty major international conferences scheduled since Rio to encourage follow-up, the environment seems to have been usurped as everyone’s favourite cause by the economy, the economy and the economy. I remember where I was during the Earth Summit. I had elected to look for an environmental experience instead of bathing in Rio’s environmental spectacle. I spent Earth Summit week sitting on top of a mountain in Bhutan while the leaders of just about every country on the planet gathered in Rio to figure out how to save the world. When I think of Rio an image of a Bhutanese farmer named Gyeltsnen comes to mind. The diverse mixture of diplomats and eco-activists who gathered in Rio (including a Bhutanese delegation which was led by the king’s sister) were looking at the big picture and posturing for the small screen. These men and women debated serious issues. Global trade patterns. Sustainable development. Transfer of technology. How to move big bucks from the people who have them to the people who don’t. How to appear selfless to the press while nevertheless getting what they, and their constituents back home, really want. Eco-politics, enhanced with more than a little eco-babble. I sat on top of a mountain overlooking a Buddhist dzong. The air was thin at 4,200 metres, and my synapses performed cosmic helicopter whirls. Prayer flags blew in the wind. While people met in Rio I looked down on a valley perhaps two kilometres wide and eight kilometres long. I counted three houses. I saw nothing but trees blanketing the hills. I’d guess that there can’t be more than several hundred Bhutanese who were aware that the world’s most important eco-conference was being held that week. The rest of the country’s 600,000 people live and will likely die without recognizing the importance to their well-being of eco-bureaucrats strolling down Ipanema and Copacabana. During Rio week I descended 1,500 meters and visited Jangtsikha village, where I had a discussion with a farmer, whose name was Gyeltsnen. It was very Aristotlean. He looked at my Swiss Army knife, my French backpack, my Italian trekking shoes, my American tent, my Australian pants with zippers at the knees to turn them into shorts. He concluded, as any sensible person from a developing country would, that I was rich. It took him no time at all to point out that the reverse was also true. He was wearing woolen homespun, he could write no language and could speak only one, his family’s most important possessions were six cattle, assorted pigs and chickens, a house he had inherited from his ancestors and his wife’s turquoise jewelry. He therefore concluded, sensibly, that he was poor. Gyeltsnen did not look convinced. I had no answer for him. And I’m sure that he probably wasn’t convinced that he was richer than most other people. No, the only way to show the people of Bhutan how rich they are will be to bus them over to Nepal so they can see how some 19 million people have wiped out their forests, how without forests the Nepalese are forced to endure regular landslides, how they suffer a chronic shortage of firewood and clean water. 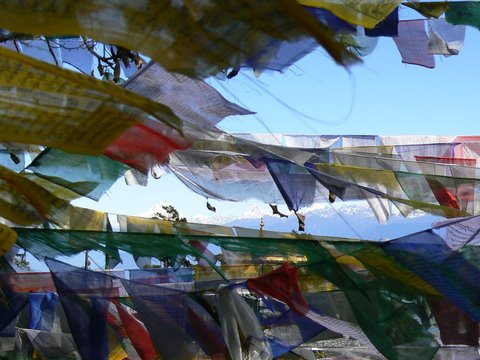 The coup de grace would be to show him what critics call “tourists’ prayer flags”, a euphemism that describes colourful strips of used toilet tissue adorning the most popular trekking routes. He would see how the Nepalese have modified their traditional cultures of Hinduism and Buddhism in order to accommodate a third religion, Tourism. How farmers can’t grow very many crops in the hills and how urbanites can’t breathe in the Nepalese capital Kathmandu. Bhutan is an economic anomaly, and it would be wrong to assume that all is well. Based on statistics like GNP per capital ($425), low life expectancy at birth (48.9 years), adult literacy (30%) and numbers of doctors in the country (42 in 1988), Bhutan lies in the bottom third on the UN’s list of countries. It also has a long way to go in the technology sweepstakes — 285 people per telephone, compared to say ten people per phone in Brazil. Yet in terms of nature it’s in pretty good shape. Bhutan maintains, by Royal decree, 60% of its land as forests. Protected areas cover twenty percent of the country’s surface. These forests provide water, but riches like regular clean water are rarely factored into the UN lists that judge how well-off a country might be. Because there are only 600,000 people in this Switzerland-sized kingdom, and because the king’s word is law, and because outside cultural and trade influence is tightly restricted (a maximum of 4,000 tourists are allowed in annually; they must pay $250 a day for the privelege), and because the government is fiscally cautious (positive foreign exchange reserves, no debt, balanced budget), this land the people call “Land of the Thunder Dragon” may continue to go its own, pine and oak-blessed way. How many other countries represented at the Rio Earth Summit have such a wealth of nature? Up here on the hill I can think of perhaps just a dozen nations which haven’t trashed their natural heritage like a rental car. Maybe it doesn’t matter that Bhutan’s national airline has just one plane which flies into a single airport. Like a pretty girl chooses her suitors, Bhutan picks and chooses the foreign aid agencies with which it wants to deal. Like a legendary princess, Bhutan lives in splendid isolation, a land where there is no democracy but where every subject can request an audience with the king. Like a wise man, Bhutan has decided, for the moment, at least, to gauge its friends carefully and not base its behavior on greed. How does a country value it’s wealth? If I were an economist I’d point out that GNP statistics mean little unless you have the vision to recognize that Bhutan has trees as far as the eye can see. Then I’d add a point that many economists would miss. There are prayer flags here that catch the clean wind and send messages to places most Rio-delegates have never dreamed of.